After 28 years painting and decorating in Staffordshire and all around the UK, working on every type of building and using traditional, modern and designer materials from countless mainstream and niche suppliers, I am confident to call myself a specialist general painter and decorator. Removing fixtures & fittings; protecting your floors and your property; full preparation work… all the “unsung” work is completed efficiently, with the minimum of fuss. We always use the best trade quality kit, including the unique Festool dust extraction sanding system which minimizes sanding dust. The result is less mess and a cleaner environment for both you and me. I always clean up after myself too! The effort we put into preparation and cleanliness results in a much better finish. Our paintwork is super smooth and all wallpapering is completed as nature intended – perfect matches and sharp cuts. 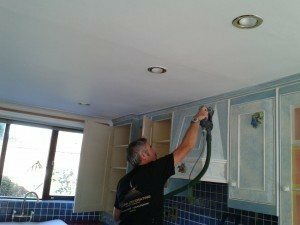 I am a member of the Traditional Painter network of specialist kitchen painters. We are a group of 20+ independent craftsmen working all round the UK and overseas too. We operate a “Teach not sell” policy, sharing our tips and tricks online. I cover all enquiries for Staffordshire and Shropshire.